The story goes something like this: at age 9, Manhattan native Nicole Ross saw “The Princess Bride”, the romantic comedy featuring, Billy Crystal, Mandy Patinkin, and lots of dueling. The rest, as they say, is history. A natural athlete, Nicole immediately took to fencing. She trained at the Fencers Club in Chelsea, where she met many Olympians and Olympic hopefuls. By age 14 she knew she wanted to count herself among them. Why did fencing hook her? “I love the combination of physical and mental challenge,” explains Nicole. “Fencing is hugely about focus and concentration, but it’s also extremely physical. Years of hard work put Nicole on the path to the 2012 Olympic Games in London. She had some setbacks along the way, including injuries to her right shoulder and hip and a hamstring tear caused by lunging too deeply in an event. For a one-sided sport that creates an asymmetry in the body, these injuries are not unusual, and are what led to Nicole’s pivotal meeting with Cathy Campbell, PT, DPT, SCS, and Clinical Director of SPEAR’s 44th street location. An All-American gymnast and Ivy League Gymnastics Champion, Cathy was no stranger to the pressures of high-level competition. Their similarities and mutual respect led to a friendship they both treasure. In September 2011, this friendship changed the trajectory of Nicole’s life. She was on her way to a training camp at Notre Dame University, weeks away from the first Olympic qualifier. She started to experience swelling in her arm, which got progressively worse as the trip went on. She called Cathy’s cell phone, crying and scared. Cathy’s instincts told her this was more than pain from overuse. She advised Nicole to get a blood test right away, and the test proved Cathy right: Nicole had rhabdomyolysis, a rare autoimmune condition that causes your body to break down its own muscle tissue, flooding the bloodstream and potentially causing kidney failure. Once her condition stabilized, Nicole realized she had stumped her doctors. “They hadn’t seen this condition before. Someone told me I was never going to fence again. This type of illness would lead many athletes to throw in the towel. Not Nicole, who was determined to see her Olympic journey through to completion. Training was off limits for the next few weeks, but all the hard work under her belt propelled her on to the World Champs, where she placed in the top 16. Ultimately, she was bumped into the third spot on the 2012 Olympic Team. She describes being at the Olympics as “once-in-a-lifetime amazing”. Her grit and determination had paid off; she reached a pinnacle most never will. Today, Nicole is feeling great, and training for the 2016 Olympics in Rio. She recently returned from the Pan Am Championships in Chile, the first qualifying event for the Games. It was a critical event for Nicole; she brought home the silver medal, a strong second place finish that will help boost her world ranking in the long run. In a show of gratitude, she brought her medal home for Cathy (see photo, inset). She also referred two other Olympic hopefuls to SPEAR for care—the ultimate compliment. The 2016 team will be named next spring, and if Nicole’s dreams are realized for a second time, she will be a part of that team. To maintain her physical conditioning, she sees Cathy twice a week. 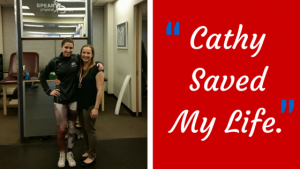 Her experiences fencing competitively—the ups and the downs—have made her stronger, both mentally and physically. What would it mean for her to go to Rio? “It would be really huge for me,” Nicole says. “It would mean achieving goals I’ve set that I haven’t yet reached, which would be really amazing. Nicole will continue to give it all she’s got to go to the Olympics again. “I love fencing,” she explains. “I had a 9-6 job. That was fine, but it was incomparable to the excitement in my life when I’m competing. I just feel extremely lucky to be doing something I’m passionate about.